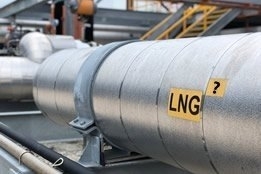 Transport & Environment (T&E) has doubled-down on its scathing assessment of LNG bunkers, saying in a new report released this week that using natural gas for transport is as bad for the climate as using petrol, diesel or conventional marine fuels. While there is no question that burning LNG reduces certain emissions compared to traditional oil-based bunkers, the full lifecycle performance on GHGs is proving difficult to assess. Some advocates say it can reduce GHGs by as much as 30% compared to HFO, while T&E earlier this year said the figure was 6% "at best". T&E's latest study now concludes that, when taking into account the effects of leakage of methane, "the impact of liquified natural gas (LNG) is close to that of marine gas oil, but these figures are highly dependent on engine methane slip and upstream leakage." Specifically, compared to a vessel burning MGO, T&E says the LNG ship will emit between 12% less and 9% more GHGs when taking the full lifecycle into account. With the industry currently focused on the upcoming IMO 2020 global sulfur cap that will see the sulfur content of marine fuel limited to 0.50%, LNG is viewed as an attractive compliance option thanks to the fact it emits zero sulphur oxides (SOx). It also emits virtually zero particulate matter (PM), as well as achieving a reduction in nitrogen oxides (NOx) emissions of about 90% compared to HFO. But there is a distinct lack of clarity over the performance of LNG bunkers for GHGs, a fact acknowledged by Peter Keller, chairman of LNG-bunker advocacy group SEA/LNG, who earlier this year said "there are still many open and important questions relating to the global warming implications of methane emissions in natural gas production and transportation as well as methane slippage in marine engines." The issue has become increasingly important following industry agreement in April to cut GHG emissions from Shipping at least 50% by 2050 compared to 2008 levels, and phase them out entirely as soon as possible. Advocates see LNG as a vital "bridge fuel" to help reduce emissions until lower and, ultimately, zero emission solutions can be developed. T&E says LNG's performance on GHGs means it will only make the decarbonisation of shipping an even more challenging transition for the industry. "Governments should resist the gas lobby's offensive and stop wasting precious public money on gas infrastructure and tax breaks for fossil gas," says Jori Sihvonen, the group's clean fuels officer. "The idea that we can decarbonise transport with renewable gas is a pipedream. What little biomethane and electro-methane we'll have will be needed to decarbonise the heating and power sectors, which currently rely on fossil gas. Pushing biomethane in transport actually makes the climate battle harder by depriving industry and domestic heating of this limited renewable resource." SEA/LNG is among a number of stakeholders looking to produce its own "well-to-wake" lifecycle analysis of GHG emissions of LNG-fuelled propulsion systems.